Savory meatballs, when combined with a fruity sauce base, tastes divine. You can use any red meat variety to make this meatball recipe. 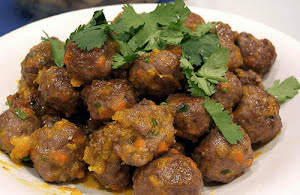 One can relish these meatballs either as an appetizer or can enjoy them with a piping hot bowl of rice. To increase the number of servings, you can liberally add shredded veggies to the meat base. If you prefer less oil, bake them instead of deep frying. Though chicken mince can also be used for this recipe, the orange sauce may overwhelm the flavor of the white meat. Feel free to experiment with the meatball seasoning to please your guests. If you're going for the baked version, keep the mince, a bit finer. It's time to quickly make these lip-smacking deep fried meatballs. Relish these delicious and deep-fried meatballs drenched in the flavorful orange sauce which makes them fragrant and totally irresistible for your taste buds. Take a large bowl and add lamb mince in it. Crack the egg in the bowl and follow with the addition of dried breadcrumbs, finely chopped green chilies, onion powder, ground black pepper, and salt. Combine all the ingredients with your hands and make even-sized meatballs from the seasoned lamp mince. Refrigerate the meatballs for about 15 minutes. Heat vegetable oil in a deep-frying pan on a medium flame. Fry all the meatballs in batches till they turn light golden brown. Place all the meatballs on a kitchen paper to remove excess oil. Add all the orange sauce ingredients in a nonstick skillet. Heat on a medium flame stirring continuously till 1/3rd quantity is reduced. Take a serving plate and place a handful of meatballs in it. Pour simmering orange sauce on top of the meatballs.